Buy 1 for $22.97Buy 2 / Save $1.23!Buy 3 / Save $4.60! Vit is vinifera L. (Vitaceae). Commonly called grapeseed. In French, it is called Vigne cultivé; in German, Weinstock. Grape vines will grow almost everywhere, and probably were the first plant to be cultivated by man. Roughly 20 percent of the seed is comprised of a quick-drying oil with antioxidant properties. The process of natural fermentation is very ancient. Beer was first brewed from fermented grain more than 3,500 years ago. The practice of making wine appears to be almost as old, and the practice of mixing herbs with beverages equally ancient. The idea of using the rest of the vine for health purposes is much more recent, probably dating to the Middle Ages, when sap from the vines was used to help support skin rashes and eye infections. Modern interest in grapeseed relates to its content of Vitamin E and linoleic acid. Grapeseed is not mentioned by Commission E.
Grapeseed oil contains procyanidins, Vitamin E, and linoleic acid. 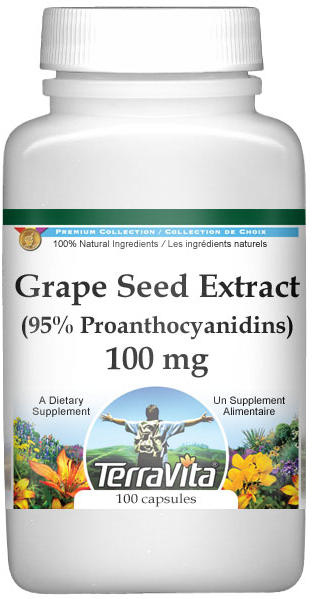 The Vitamin E probably accounts for grapeseed's antioxidant effect, although the flavonoid proanthrocyanidins contained in the oil are also effective antioxidants. In two very large population studies, no benefits from Vitamin E supplementation could be found. But in other studies, double-blind at that, researchers found that supplements lowered the risk for coronary artery problems. A separate study of Finnish smokers failed to detect much of a benefit in improving cardiovascular health, but men taking 50 International Units (IU) a day of alpha-tocopherol had far fewer cases of prostate health problems than controls not taking the supplement. Interestingly, studies published at almost the same time reported that giving selenium also reduced the risk for prostate health problems. Since selenium is just as powerful an antioxidant as Vitamin E, it appears that the results from Finland are not a fluke. In addition to containing Vitamin E, grapeseed oil also contains linolenic acid, although not nearly as much as is found in sunflower oil and safflower oil. Conjugated linolenic acid (called, CLA, and consisting of multiple linoleic molecules bound together) supports healthy immunity levels. It is formed when linoleic acid in grapeseed is converted to CLA by intestinal bacteria. To the extent that linoleic acid replaces other fats in the diet, it causes good cholesterol (HDL) levels to rise and bad cholesterol levels (LDL) to fall, actions consistent with the reduction of heart health issues. Antioxidant supplementation may have other benefits over and above supporting healthy immunity levels and heart health issues. There is an emerging consensus that "oxidative stress" plays a role in memory loss, and that using Vitamin E may help. The effective dosage has never really been determined. Most researchers feel that if Vitamin E supplements are to be taken, then at least 800 International Units a day will be required to produce any benefit. The Vitamin E content should be indicated on the label of the grapeseed product being purchased. Can you tell me what it does to your body as a whole and does it help with weight control. Grape Seed Extract can help protect the skin and internal organs against the ravages of stress and environmental toxins by acting as a potent and powerful antioxidant. Regular use of Grape Seed Extract may help to improve your immunity and has also been found effective at repairing connective tissue. While there have been small studies performed to test the effectiveness of Grape Seed in weight loss and they have been successful, there are more studies required before it can be proven that Grape Seed does assist with helping one to lose weight. I would suggest that you sign-up for the ZooScape.com newsletter (which you can do directly from our home page) as the most recent edition does contain information regarding healthy weight loss and recommendations for herbal supplements to help you achieve your weight loss goals. Some product recommendations that you may want to consider are Grapefruit Plus Diet, Apple Cider Vinegar or Metabolism Formula. There are several different types of Vitamin E. The form found naturally in our foods is gamma-tocopherol, a potent antioxidant. The Vitamin E found in supplements, such as grapeseed, is mostly alpha-tocopherol. There is laboratory evidence that when taken in very large amounts, alpha-tocopherol can block the effects of gamma-tocopherol, in effect, acting like a prooxidant! Very high doses of Vitamin E can disrupt normal body metabolism of Vitamin K, and that can lead to bleeding tendencies. Patients taking anticoagulants such as coumadin should not be taking Vitamin E-containing products without first notifying their doctors. There is no evidence that any of the components of grapeseed oil will interfere with any of the standard workplace urine drug screening tests.